After searching your closet for the umpteenth time trying to match up your shoes, you have finally have had enough. 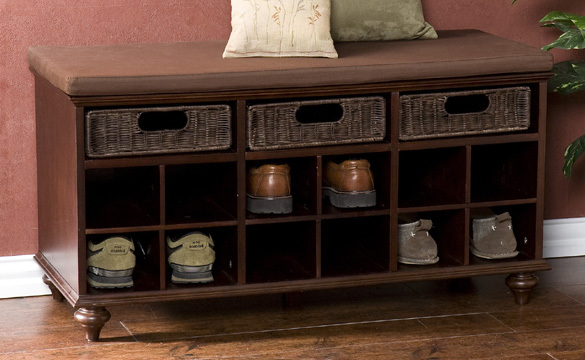 You have heard and maybe even seen a shoe storage bench before, and now you’ve decided to find one online and buy it. With so many choices on the web, which one is the right one for you? Before you order a new shoe bench, you have to ask yourself a few questions first. Where do you plan on using the bench? Do you want it in your entryway hall or do you plan to use it in the garage. Would you prefer everyone in your home had one, so you will then place him or her in the bedrooms? Other questions you need to ask is how much room do you have for a shoe bench? You will find that they can be anywhere from 24 inches wide to over 60 inches wide. And of course the age old question, how much do you want to spend on one? In the $40 to $50 range you can find a good starter shoe bench. These will typically range in width from 24 inches to 36 inches. They will have a wood sitting area (unpadded) and will have racks under the bench. These are good to use in the garage for wet shoes and boots. The open design of the rack will allow the air to circulate around the shoes so they can drip quicker. Another good place for these benches is in a college dorm. This can help organize the student’s shoes, plus it can double as a seat since dorm rooms tend to be small and you need to make every inch count. If you can look in the $100 to $200 range, then you will find a much larger selection of shoes storage benches from which to choose from. These benches are not only functional, but also will look nice in any room. These storage benches will hold from 12 to 30 pairs of shoes depending on the size of the bench. Bench size will ranger from 42 inches to over 60 inches. You will be able to place the shoes in cubbies under the padded seating area. Also in this price range, you can usually find a shoe storage bench that will come with 3 to 4 drawers. This would be a handy place to store your gloves, hats and other things you need by the front door.